Right up till the last couple of years, co-working spaces were considered niche working environments — catered to just startups or freelancers; today they are mainstream players in the corporate world, with even Fortune 500 companies signing up as tenants. And in recent months, more of these hip and snazzy offices have been popping up all across the central area of Singapore. Take US-based co-working giant WeWork, for example: since it expanded to the Republic, a year ago, the company has launched 9 co-working spaces here (thanks to its hefty war chest). And while it appears to be the dominant player in the land, there are also a handful of other brands including The Great Room, JustCo, Collison8, to name a few.It is a fragmented market — and it is becoming difficult for a consumer to select from the myriad of options the most suitable co-working space for their needs. Singapore-based startup workbuddy wants to alleviate this issue, by building a “ClassPass”-esque system for co-working spaces.For those unfamiliar with ClassPass’s concept, it is a fitness club aggregator that offers a monthly subscription service so members can go for classes at different gyms without signing up for a whole array of club memberships. Like ClassPass, workbuddy provides an app allowing members to access the different partner establishments easily. 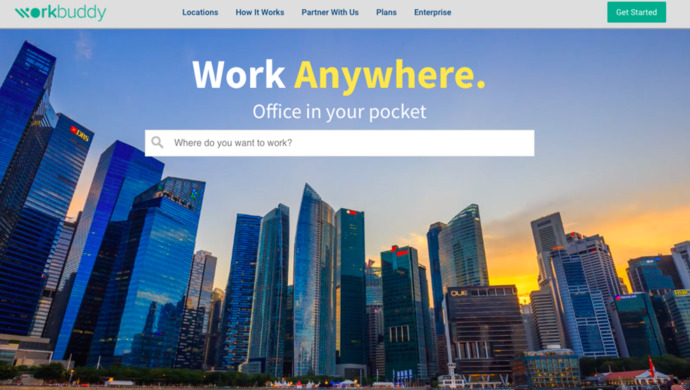 workbuddy’s Co-founder Gaurav Joshi believes that while the rise of co-working spaces have granted workers more freedom to choose where and how they work, there are still obstacles.“Co-working spaces have grown from just a handful to over a 200 [in Singapore] in just a few years, but the limitations are that members still have to commute and commit to year-long contracts…we wanted to provide Singapore’s professionals with a new level of freedom, enabling them to access workspaces all over the city, anytime they need to,” he says.This problem sparked the idea for an all-access pass for different co-working spaces. In an email interview with e27, Joshi elaborated more on the company’s founding as well as his future plans. Tell me the genesis of the company. When and why did you come up with this idea? I’ve been in the flexible workspace industry for some time now. When co-working first came to Singapore it was more for travelling businessmen and freelancers. There were just a handful of spaces and remote working had yet to really catch on.Today there are over 200 different locations run by between 60 to 80 operators. But there was still a big gap in the market and working with enterprise clients myself, I saw first-hand that organizations were still not getting what they wanted 100 per cent. It was apparent that enterprises who wanted to give their staff greater work location options were still not getting what they wanted.Additionally, real estate managers struggle with high real estate costs combined with underutilized space, with recent studies indicating that organizations are not utilizing 25 to 30 per cent of their current office space. With a rise in mobile workers, the gig economy is seeing companies look for more flexible space options.We wanted to fill that gap and give people greater choice and flexibility. Traditionally when signing up with a co-working space you are locked into contracts that are months long, and even then, it might be a case where one single operator might not be a suitable fit. Each operator has several locations and often with a certain design aesthetic and environment across its locales.When you have a diverse team with differing needs, signing up with one co-working space might not be a complete solution. Some staff might want a more creative space in Katong [a district in Singapore] whilst others might want something more corporate in the heart of town. The staff might also need a wider range of locations to work out of; they may need to work from Katong today, Orchard tomorrow, and harbourfront the day after. That is one of the main problems that workbuddy sets out to solve. Do you have a list of all the co-working spaces you are partnering with? As of today, we have more than 20 locations that we offer users.Over the next few months, we will be expanding this, with an aim to be working with 40 locations soon. However, user usage and feedback will be a crucial factor for us and our decision of who we work with will always be determined by user needs and wants. Do the fees allow you to access all facilities of each co-working space? Users will have access to a wide range of facilities at each co-working space including access to beverages and desks. Similar to being a part of a co-working or serviced office, printing and meeting rooms are an additional fee. Users could make payment to the co-working space directly or through the app for a seamless experience. What about those that have their own apps, activities, communities, do they get access to that as well? For example, like WeWork’s free massage classes and free food. Being a workbuddy user will allow you access to a wide range of perks provided to members of various co-working spaces. This includes access to networking events, talks and access to communities. The great thing about co-working spaces is the ecosystem that they are part of and we really wanted our users to get to be a part of that as well.The workbuddy app also provides access to marketbuddy. marketbuddy is workbuddy's exclusive platform for members which gives them access to other business community members. It expands the reach of members to outside a single co-working space or company, establishing a network with other professionals for sharing ideas and creating opportunities.Members will enjoy exclusive perks and promotions available to members and list your business and services unlocking the potential of the community to generate more business. we will be back again with more on this soon. Will you be offering other membership tiers or prices? Currently, we offer two membership tiers, the LITE plan at S$129 (US$84) a month that provides a 5-day monthly pass and access to all locations, as well as the UNLIMITED plan at $299 (US$218) a month which is an unlimited monthly pass that provides access to all locations.We are looking to provide further membership tiers and offers in the future. Will you be seeking a partnership with WeWork? We are actively expanding our footprint through partnerships with co-working spaces and would not rule out working with any specific co-working space providers in the near future. Are there plans to launch your own co-working space? As of now, launching our own co-working space is not part of the plan. Do you plan to seek external funding? Currently, in the pipeline, we intend to expand into other countries within the region and will be seeking funding when the time comes, but more importantly, when the right strategic partner comes along. How many users have signed up for each of the two pricing tiers? Membership is growing at a fast pace and we already have a large number of users at launch. We expect to reach 300 members by October this year.